Boo! It might be summer, the season of blue skies and beach bodies, but you know what's way more fun? That's why stores across North America will run Ghosts Love Candy Game Days this weekend. The events will feature demos of the new game, plus lots of free promo items, including cards and finger puppets. 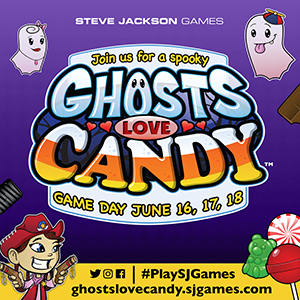 Share pictures on Twitter, Facebook, or Instagram with #GhostsLoveCandy to be automatically entered to win a playmat and a signed copy of the game! Also, feel free to dress up. It might not be autumn yet, but when you play Ghosts Love Candy, it's always Halloween, and you're a ghost haunting trick-or-treaters to get some of your favorite candy. This is no trick, just a treat! Get to an event this weekend and you'll agree.